Every house has a story. Every room has a story. And this is the almost perfect book to tell it. Quite an amazing feat. Starting with the house, you go into almost every nook and cranny of the house that you can think of, including the bathroom, kitchen, dining room, living room, the hall, and the things that make up the house, like electricity, the spices in the kitchen, and those two, no three, tumblers of salt and pepper. Why only salt and pepper? No one knows. Really. No one knows. Or how did corn and potatoes become so staple a feature of our diets? That people in olden times had little time for anything except work, which brought them money for food, which took up an enormous proportion of their incomes, is documented in stark detail in the chapter "The Kitchen"
Which brings us to the provenance of the phrase, "baker's dozen"
The history of ice is equally fascinating. Or that of electricity. Or the rise of New York city in the United States. And so on. The weakest chapter may well be the one on "The Drawing Room", where there are more than a few digressions and detours that don't seem to take the reader back to the starting point in quite the same way as the other chapters do. Such an exercise can quickly turn into a literary drudgery of sorts. 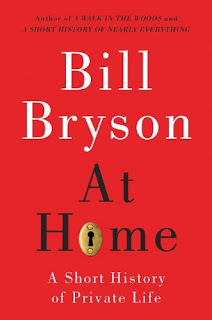 What keeps this book a page-turner are three things: the logical collection of facts into chapters, each of which serves to take the reader into a part of the house. Secondly, the skillful weaving of a ton of facts, nuggets, trivia, history, and more into a seamless narrative. Thirdly, the use of humour in writing, without overpowering the reader. Sample this, "If it was his goal to make as little an impression as possible upon history, he achieved it gloriously." It can become a bit overwhelming if you were to attempt to read this book in one sitting. A more rewarding option would be to read it one chapter at a time, and finish the entire book in a week or two. You can keep coming back to this book again and again, and can literally open it to any page at random, start reading from that point onwards, and expect to be rewarded by pearls of discovery. © 2010, Abhinav Agarwal. All rights reserved.